I would suggest that on Keen 8, the sounds for the level entering/exiting, gun picking uping, etc be updated to match Keen 9's sounds. Also, the DOS screen when you quit should be updated to make it match 9's DOS screen. Strangely though, I think one of the shortfall goplats disappeared on my when my back was turned. I'll see if I can't replicate this one; does anyone know if the idle animations screw up goplats? -In most of the demos, Keen gets himself killed! And in one, he keeps clinging to the right end of the level, and shoots repeatedly towards it though there's nothing there. -In the demos, the High score screen is played in a second time, with all the entries on the scoreboard blank. -Also, that screen just shows blank space, it should probably display the entire planet of Calidune. I used no clipping to get to the Warpcore, then turned it off, then turned on god mode. I used the B-A-T cheat to get 99 shots (which in retrospect I didn't need...). Well this may be a bug but it's easily avoided... Don't use god mode. I think, rather than that "See you next time..." screen in the ending, Keen 8 should have another "to be continued..." splash screen like in Keen 4 and 7.
in a bunch of the spots in K8 the Boulder level, cobrits randomly attacked from the skies, i would've died many times had i not used got mode to see the changes you made. I wasn't expecting to see a K8 beta so soon, with all the discussion about revising K7. This was a pleasant surprise. I think that we're getting 9 and 8 fixes first because they're mostly just game fixes and not also cosmetic adjustments. I have a small complaint about UNLZEXE. The original release of K9 included a .BAT file that did the whole procedure. That was quick and easy to use. The latest Beta, however, does not include the .BAT file. And the really sloppy thing is that the Read Me does not include instructions on how to use this program either (and I've never used it before). Therefore, I suggest that you always include the .BAT file in the .zip archive, or at least provide detailed instructions on how to use UNLZEXE in the Read Me file. 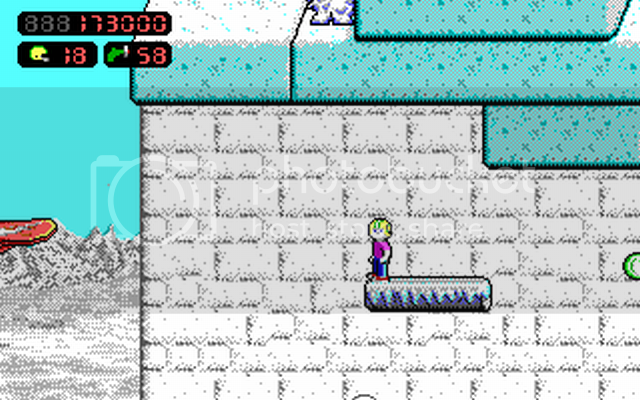 Commander Keen wrote: I would suggest that on Keen 8, the sounds for the level entering/exiting, gun picking uping, etc be updated to match Keen 9's sounds. Also, the DOS screen when you quit should be updated to make it match 9's DOS screen. Just like Keen's 4-6 each have unique entering/exiting sounds, I plan to do the same here. Currently the original Keen 8 sounds are used, so I may modify them slightly. I may add the neural stunner sound from keen 9, although I do like having the exotic keen 6 sounding one for this episode. I will update the DOS exit screen, thanks for pointing that out. Pokota wrote: Strangely though, I think one of the shortfall goplats disappeared on my when my back was turned. This happens sometimes when you stand on a goplat that drops for too long. I don't know what causes it. -I'll try to fix the demos, although this can be really annoying since demo playback has an annoying way of not playing the same way it's recorded. -The problem with a scrolling story image is that only certain colors can be used and none of them match the desert look of the planet. I may be able to patch this, but even then, part of game is not knowing what lies ahead on Calidune and a planetary image might be too revealing. Jayo wrote: I think, rather than that "See you next time..." screen in the ending, Keen 8 should have another "to be continued..." splash screen like in Keen 4 and 7. I can try to do this, although Keen 6 only has 3 story images to work with, so it may mean either Keen flying away from Calidune in the imposter's ship or the static screen are removed. The setup file is supposed to still be in there, I don't know how it was removed. I'll try to make these things happen in the next week or so. Thanks for the feedback so far, guys! 1. On the first page of the "Story" section, second sentence, there is a repeated word. "But after braving the dangers of of the planet..."
2. I noticed something unusual at the end of the opening text crawl - check this screenshot. Is this a bug? 3. A glitch on the world map - the elevator to the Krodacian Overlabs. When you ride it downwards, it immediately sends you back up again (i.e. it doesn't let you move away from it). When you use the elevator a second time, it works correctly, though. Keeper wrote: 3. A glitch on the world map - the elevator to the Krodacian Overlabs. When you ride it downwards, it immediately sends you back up again (i.e. it doesn't let you move away from it). When you use the elevator a second time, it works correctly, though. Yeah, we've mentioned that already, too! He can't seem to find a way to fix that. I found yet another of those strange grey dots in Fort Yetisburg.